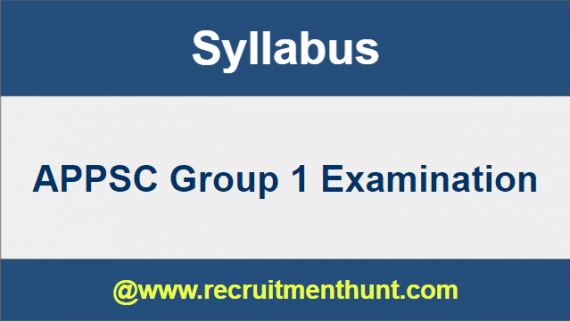 APPSC Group 1 Syllabus 2019 Latest APPSC Group 1 Syllabus is updated here. Download AP Group 1 Syllabus & APPSC Group 1 Exam Pattern 2019 for prelims and mains exam to make preparation plan. So, interested candidates can check the APPSC Group 1 Syllabus 2019 from the below sections. We have also provided APPSC Group 1 Previous Papers along with solutions. Therefore, aspirants can check and download APPSC Syllabus 2019 & APPSC Group 1 Solved Previous Year Question Papers from the below sections. Candidates can also check all the detailed information by visiting our site www.recruitmenthunt.com. Candidates who are searching for APPSC Group 1 Syllabus 2019 and AP Group 1 Exam Pattern 2019 reached the right place. We gave Andhra Pradesh PSC Group 1 Syllabus and APPSC Group 1 Exam Pattern 2019 details to crack the exam. The Syllabus is the important consideration while making your preparation plan for APPSC Exam. For that reason, we gave the official APPSC syllabus for Group 1 Exam here. Download Topic wise APPSC Group 1 Syllabus along with APPSC Group 1 Exam Pattern 2019 for ease of your preparation. The APPSC Group 1 New Syllabus 2019 Pdf contains all the topics that are covered in the APPSC Group 1 Exam 2019. APPSC Board recently released APPSC Group 1 notification to fill 78 vacancies for APPSC Group 1 Recruitment 2019. Hence it is a wonderful opportunity for the candidates who are eagerly waiting for government jobs in Andhra Pradesh. You can also check the daily notifications from our website and apply for the various government jobs both central government and state government. Coming to the APPSC Group 1 Syllabus, you can check and download complete APPSC Group 1 Syllabus from the link given below. APPSC Group 1 is conducted in three stages. APPSC Conducts Group 1 Mains Exam to the candidates who qualify prelims exam. So, have a glance at the AP Public Service Commission Group 1 Syllabus and APPSC Group 1 Exam Pattern 2019 which is given below. The complete details of APPSC Group 1 Examinations are mentioned in the above table. Candidates can also check the full APPSC Group 1 Services Exam pattern 2019 and timings from the given link below. The Group 1 Prelims Exam contains the questions from the general knowledge category. Candidates should prepare GK thoroughly to qualify the Prelims exam. Hence, Candidates should concentrate on the Group 1 General Knowledge Syllabus first to qualify the prelims exam. After that candidate can prepare for the main exams of Group 1. The APPSC Group 1 Mains Exam contains five papers in conventional type. The General English paper is for qualifying, and its marks are not counted for final ranking. All the question papers except General English may be answered either in English or Telugu or Urdu language which can be chosen by the candidate. So, please visit our website daily to get more latest updates regarding all Government Jobs, Syllabus, Previous Papers, etc. Here, we have given the complete details of syllabus of APPSC Group 1. First, Check the syllabus for APPSC Group 1 Preliminary exams and also check for the APPSC Group 1 Main Exams. Current Affairs – International, National, and Regional. General Science and Contemporary Developments in Science & Technology. The world, National, and Andhra Pradesh Geography. History of India Ancient, Medieval, Modern –socio-cultural, Economic and political affairs with special emphasis on Indian National Movement. Indian Polity and Governance, Constitutional issues, public policy formulation, Governance Reforms, and e-governance initiatives. Economic development in India since Independence- the role of planning; Planning Commission, Niti Ayog, India’s economic problems such as poverty and unemployment, agrarian crisis, irrigation and water, sustainable development, inflation and balance of payments, growth with stability and social justice. Centre-State Relations, Finance Commissions, Sharing of Resources between Centre and States – Decentralisation. Disaster Management, GIS in the assessment of Disaster, vulnerability profile, prevention, and mitigation strategies Application of remote sensing and GIS in the assessment of Disaster. Environmental degradation and challenges – Sustainable Development and Environment Protection. India’s Economic Reforms –Banking, Financial, trade and social sector; New Challenges in a Globalised Context – Global competition, Financial market instabilities, FDI flows, GST, etc. The Group 1 Mains English exam syllabus contains the following topics. There are 5 papers in total for the Group 1 Mains Exam. APPSC Group 1 Mains Exam Paper I contains the following syllabus. Paper I is a general essay. APPSC SECTION 1: Crisis Management, Social, Economic & Health Problems, Analysis and solutions, Conflict Resolution, Decision Making, Ecological intelligence. APPSC SECTION 2: The second section contains Current events, policies, schemes, and programs of National and International importance. APPSC SECTION 3: General Current events, policies, schemes of the state, and programs of AP state. These are the main topics of Group I Mains Paper 2 Syllabus. History & Cultural Heritage of India. The advent of Islam and its impact. Social History of Andhra Pradesh. A general overview of Indian Constitution. Social and Cultural movements in Andhra Pradesh etc. National and Per Capita Income and Human Development. Land Reforms and Social changes in Andhra Pradesh after independence. Andhra Pradesh’s Economy, present status its Strengths and Weaknesses, etc. Planning in India & Indian Economy. Current Science & Technology Developments in India. Space Programme in India, its Applications with Reference to industrial, Agricultural and other rural development activities. Global Environmental issues and role of Information Technology. Role and Impact of Science & Technology in the development of India. General Awareness of the Modern Trends in Life Sciences etc. Data Presented in the Tabular Form in Graphical etc. Logical reasoning problems like Calendar and Clock Problems, Blood Relationship, Seating arrangement etc. Coding and Decoding problems: coding using Ciphers and non-cyphers. Problem Solving using Venn Diagrams. Finally, Candidates can download APPSC Group 1 Syllabus here. So, Applicants can make their preparation easier by following APPSC Group 1 Syllabus. Download APPSC Group 1 Exam Patterns along with APPSC Group 1 Previous Year Question Paper on this article. Also, For more Job Updates stay Tuned to our site Recruitment Hunt.